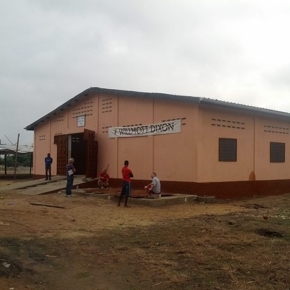 The Willmott Dixon Partnerships 4Life Academy is one of the final major projects required so that the village of Agome Sevah can be said to be self sustainable and in a position to truly prosper. It is a project which will provide employment and commercial opportunities for the villagers as well as providing an employment opportunity for anyone in the region, indeed in the country. Unlike the few Government run establishments the students will not have to have a qualification to enrol. In November 2013 detailed planning began, including the basic design of the building and budget. This continued for few months alongside planning and fund raising. 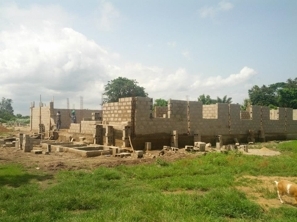 Construction started in earnest in April 2014 once the land had been cleared and officially registered in the name of the village of Agome Sevah. Fund raising went very well with over £30000 raised and with the Willmott Dixon Partnerships employees raising a significant amount. Willmott Dixon Partnerships also provided a team of experts who, working with Rod Unger and Papa, oversaw the whole project. Willmott Dixon Partnerships then sent out 5 Apprentices and two "Supervisors" to help build the Academy, pass on their skills and knowledge and attend the official opening. The opening in September 2014 was a joyous occasion with many Government and local dignatories attending. There was a lot of singing and dancing as the villagers celebrated another big step forward in the journey towards prosperity. 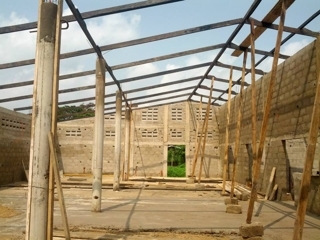 This facility will provide a basic training qualification in any number of “trades” as well as bringing commercial activity to the village and surrounding communities.These trades will include solar engineering, construction, dressmaking and agriculture. This is a complex project as it involves any number of different parties and we started without any existing resources or buildings. We are very nearly ready to fully open having had to wait for Government approval before we could appoint teachers etc and get help from various Government departments. It is now being used for the teaching of solar installations, hairdressing and dressmaking with more trades to follow. Amazingly Willmott Dixon then offered to build an accommodation block to house students and teachers alike!! At the same time one of Willmott Dixon Partnerships' client partners The Phoenix Housing Trust agreed to raise funds for the required restaurant alongside the accommmodation building.